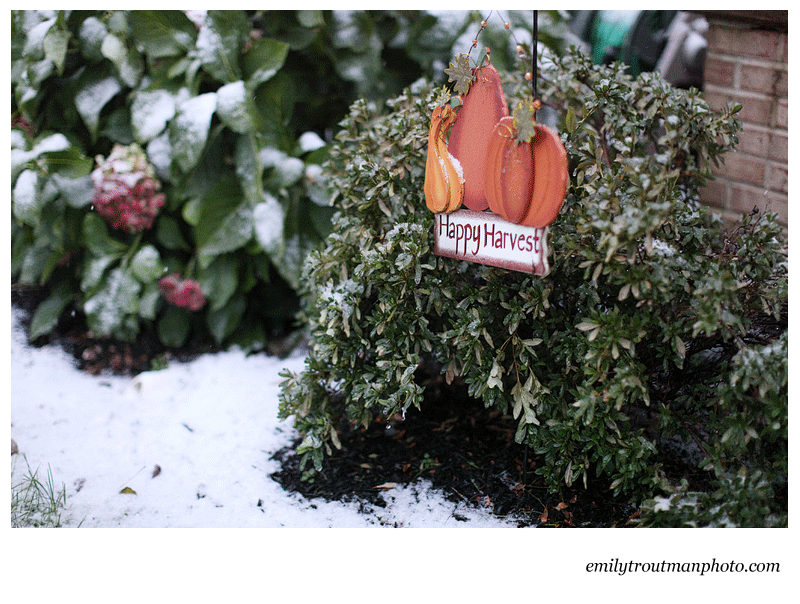 Snow on pumpkins isn't really a normal occurance for us here in the Mid-Atlantic. It was a little freaky and left most of us wondering about what type of winter is to come. 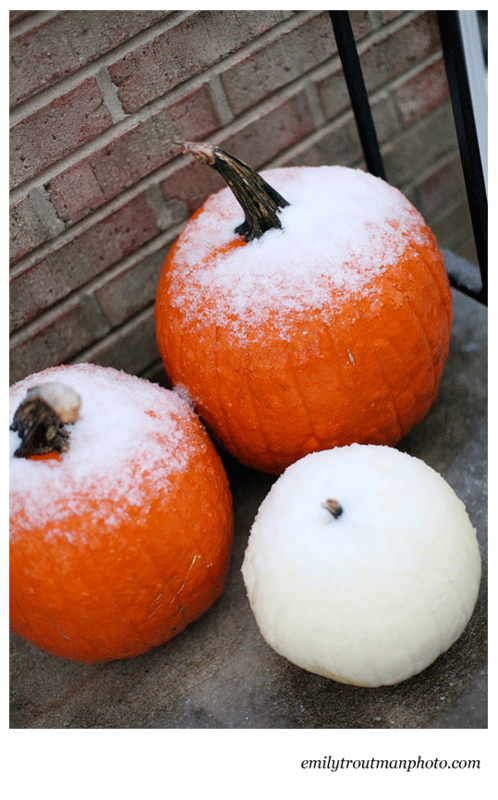 We had to wipe the ice and snow off our pumpkins over the weekend in order to carve them! Just wanted to share with you a photo post about the last few days around our house, enjoy! His costume was a little big and the boot thingies only lasted 60 seconds before removal for being too big and in his way of running around! They are saying "stick 'em up" in this one! Can you even tell this sweet girl is sick? Sometimes expressions are weird like, "I could just eat you up," but then there are times they just make sense! I met my sweet new friend Charlie for a little spring photo shoot. When he showed up dapper in his little khakis and sailor sweater vest, I could literally...EAT HIM UP! His smiles, his cheeks, and his energy all made my job fun. Having two almost 2 years olds myself certainly helps me when meeting a new toddler, we have lots to talk about like Elmo, going on easter egg hunt,s and airplanes in the sky... you know... the good stuff! 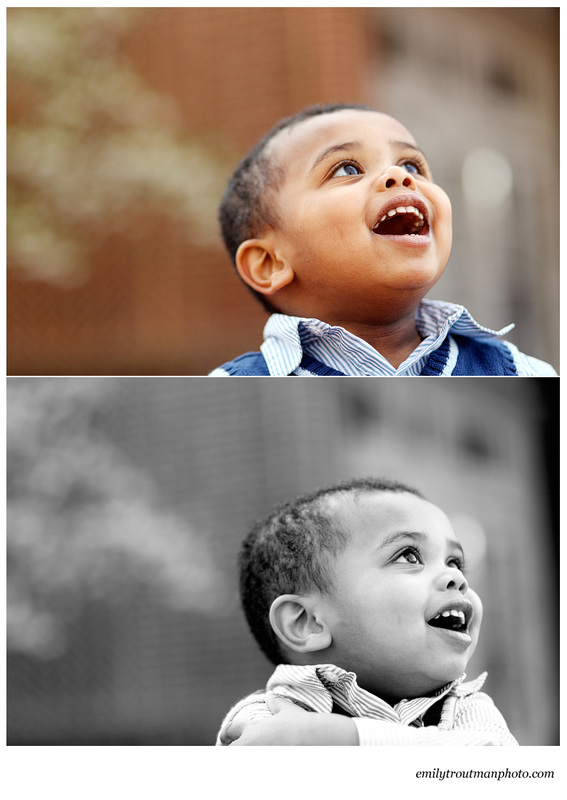 I had a lot of fun on a pretty spring day capturing this little boy's spirit. Charlie of course had his pretty mommy along for the adventure too and we of course managed to get some shots with her too! Love the tongue, I swear it always helps a person concentrate! I mean REALLY? He probably gets away with everything because of this cheeky smile! An airplane flew over head and it was major cause for excitement as we tried to spot it in the sky. Charlie decided he could stand to sit for a few more frames with Mommy included. Thanks Charlie and Melanie for making me remember why I love my job! Last week as we were gearing up for the holiday weekend, I got to do a morning shoot with a friend and her sisters. Since everyone was in town, she thought it would be a great opportunity to get everyone together for a shoot for their mom. We had fun with all the grandkids and some of them liked my camera better than others :) Here are just a few of my favs from the day.... of course the one of all of them with the funny faces pretty much just makes me laugh! Notice the two crying to the right, this wasn't just for the "funny face" picture... Gotta love kiddos for keeping me on my toes! So these pics of my kiddos are actually from last weekend's snow storm. This one was too ridiculous to even take them outside :) Don't worry - we sat them on a towel (which you can see in some shots) but hey, it was just for the fun of it. Dean even took a bite of snow to see what it was all about. Enjoy! Last weekend I got invited to do a shoot for a friend of her two year old nephew, Christian. What a stinkin' cutie! I mean he was dressed perfectly and could work up tears that would break your heart at the drop of a hat! He even already has a strategy for how to eat an oreo, he just eats the cream and he loves choo-choo trains (lucky for us there was one where we met). What's not to love about this adorable boy?! Enjoy him as much as I did!